Precision Ground Balance Control: Balance out the ground iron mineralization of hot rocks, black sand, and other tough grounds. Pulse Delay Control: Labeled for best performance settings - Small, Gold, Wet Salt, Large Target. Variable Audio Select: With Ground Balance "ON". 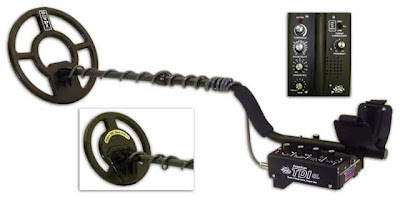 Allows variable audio to low, high-conductive targets, or both. Get extra sensitivity for tiny targets and still keep volume at a comfortable level. Threshold Control: Accurately adjust the audio to hear the smaller, deeper signals. Frequency Control: Adjusts for hunting near power lines, microwave or other environmental interference. Battery Life L.E.D. : L.E.D. light to indicate battery life. Waterproof 7" or 12" spider search coil: Other accessory coils available. Batteries: NiMH Rechargeable Battery Pack included. Alkaline "AA" battery pack also included. Two-year Parts and Labor Warranty.